i went to singapore during the halloween holidays with the other ex-vicon people (just add C and T to ex-vicon, interpolate the letters, and you'll find out who we really are! kidding). 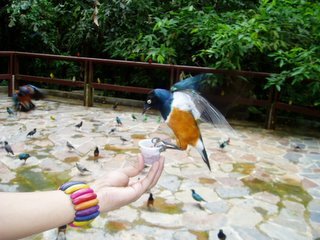 the jurong bird park was my pinakapaboritong napuntahan. i enjoyed watching shows such as parrots singing, in an operatic pitch, singapura and my bonnie lies over the ocean. i especially enjoyed feeding the birds with live worms! the night safari was also one thing which i enjoyed very much. i kinda felt like belonged there, in that zoo. but not that i'd be one of those animals there, mind you. i felt like i could be one of the staffs there riding in the tram to entertain people while they observe the animals in their "natural" habitat. it's amazing how giraffes, elephants, tigers, lions, deers, anteaters, and hyenas have been living in an territory where their actual habitat were somehow replicated. 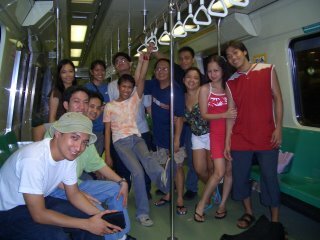 anyways, there's no more fun, though, being there than being with the company of my vicon friends. i got to see (after a long while) sue, my ever beauteous friend, again. it was fun being with her, her beau johnx, rache, audie, raki, lennard, benjie, noemi, lawrence, radwin, and joe! special thanks to sue, johnx, and bendz for being our gracious hosts and tour guides! anyways, i read in ria's blog that she finds singapore a romantic place. yup for one (or two) there's clark quay and boat quay (pronounced as key - ganun pala yun??? kala ko talaga kwey). but other than it being romantic, it's a good place to work for people in the IT field! dun ang mga pinoy naka-condo with all amenities u can imagine! pool, gym, tennis court, basketball court, parang country na ang mga condo! mabubuhay ka na dun na di lumalabas!